This is a guide about making your own memory foam pillows. 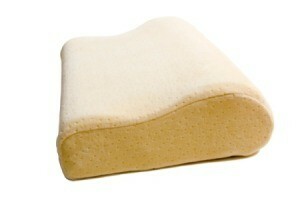 Memory foam pillows offer support for your head and neck, helping you get a good nights sleep. Here is some information for how to make inexpensive, memory foam filled pillows. Make your own memory foam pillows and save money. Buy a bargain priced (single bed size) 3 inch memory foam mattress pad and two zippered pillow case covers. Measure the pillow case covers and cut 4 pieces of the memory foam the same size using a yardstick and marking your cut lines with a Sharpie pen so you have the right size and cut a straight line (I used scissors to cut them). One at a time, tuck two of the pieces carefully into each pillow case so there are no lumpy spots, and zipper them in. Cover as normal with pillow cases. They are very comfortable and affordable. Afterward, I took two small strips of leftover foam and inserted them lengthwise into an older pillow case and tucked the ends of the pillow case in. I use it as a lumbar support for my back in my car. It gives just the right amount of support and it isn't lumpy because it molds to your back. You can make pet beds using this method also. Much cheaper than buying them from the pet store. I worked at a fabric store for a while, and we sold that foam there too, in various sizes, densities, and thicknesses. We had a reciprocating saw to cut it; when it burned out, we needed something we could use until we could receive a replacement. We found that those inexpensive retractable snap-blades cut very accurately, and smooth like a warm knife through butter. Cut on a hard surface like a kitchen or bathroom floor, even the bathtub in a pinch. Mark the shape with a ruler and pen (if needed), then cut away! Stand/kneel clear of the blade and keep your hands clear, use a gentle touch, and take your time. The reason we used a snap blade is because we could adjust to the different thicknesses of foam and cut more accurately. A blade will last a long time for this purpose if this is all you use it for. An electric knife is what I have always used for thicker foam. Works great.